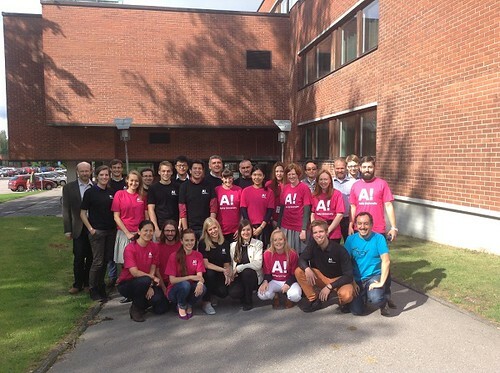 After the successful first edition in Berlin 2013, DHC+ had invited interested students and young professionals to Helsinki in late August 2014 for its 2nd International DHC+ Summer School. 29 Participants from all over Europe and far beyond came to the Finnish capital to learn about district heating and cooling, to exchange views, to apply their knowledge and visit various sites. The course was hosted by a strong consortium including Aalto University (where the classes took place), Finnish Energy Industries, Helen and Fortum, and featured teaching lessons prepared by a variety of experts from academia and business across the continent. After an introductory session and a fantastic cruise around Helsinki’s islands followed by a great Finnish dinner, participants got an overview over all important bits and pieces in district energy by Prof Sven Werner (Halmstad University). The following days concentrated on the three big areas: consumption, distribution and production. The day on consumption was lead by Jan Eric Thorsen and Oddgeir Gudmundsson (Danfoss) and provided crucial insights into the functioning of heat exchangers, valves and other consumer side technologies. Moving towards distribution Prof Risto Lahdelma and Haichao Wang (Aalto University) offered a broad overview of network design calculations and dimensions. Wednesday dealt with primary energy factors and various production solutions such as CHP or solar thermal, and was lead by Prof Stefan Holler (University of Applied Science and Arts, Hannover) and Thomas Schmidt (Solites). The theoretical lectures were accompanied by practical applications of the gained knowledge and technical site visits. The participants got the opportunity to visit Helsinki Energy’s Katri Vala heat pump station which is situated underground and connected to the other big plants by a extensive tunnel system, as well as Fortum’s Järvenpää biomass CHP, the most modern one in the country. Subsequent to this first part of the summer school, the students and young professionals were welcomed at the exhibition of the Finnish District Heating Days and got the chance to network with a variety of industrial players in the sector. The next day saw an interesting conference programme in English language organised for the summer school participants and other international guests. After this networking experience, the students and young professionals were challenged by Ralf Roman Schmidt (AIT) with the final group task: they were asked to design their own project plan for developing a sustainable system for a smart city taking into account various aspects of energy and society. The results were presented to the fellow course participants as well as experts representing major players in the field such as Helsinki Energy, Finnish Energy Industries, Euroheat & Power, Vattenfall, Fortum, Aalto University and others. Presentations included well-developed solutions for cities such as Ulan Bator and Paris and it proved to be difficult to choose the best project. In the end a Malmö-based concept was the most convincing one.